↑ "Our Strength Lies in Who We Are". intelligence.gov. Archived from the original on August 10, 2014. Retrieved August 4, 2014. 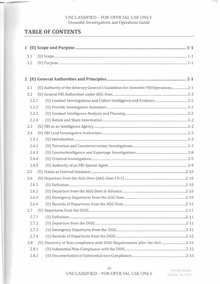 ↑ "How does the FBI differ from the Drug Enforcement Administration (DEA) and the Bureau of Alcohol, Tobacco, Firearms and Explosives (ATF)?". Federal Bureau of Investigation (in ਅੰਗਰੇਜ਼ੀ). Retrieved 2017-11-02. ↑ "Federal Bureau of Investigation – Quick Facts". Federal Bureau of Investigation. Archived from the original on 2011-10-17. ↑ "Mission & Priorities". Federal Bureau of Investigation (in ਅੰਗਰੇਜ਼ੀ). Retrieved 2017-11-02. ↑ "FBI- Quick Facts". Federal Bureau of Investigation. Archived from the original on 12 April 2015. Retrieved 19 April 2015. ↑ "British 15-year-old gained access to intelligence operations in Afghanistan and Iran by pretending to be head of CIA, court hears". The Daily Telegraph. 19 January 2018. ↑ "British teenager who 'cyber-terrorised' US intelligence officials gets two years detention". The Independent. 21 April 2018. ↑ UK teen Kane Gamble gets two years for hacking CIA ex-chief John Brennan". Deutsche Welle. 20 April 2018. ↑ "Hackers publish contact info of 20,000 FBI employees". CNN. 8 February 2016.